A while back I was trying to get a bluetooth dongle to work in P 8, wouldn't go. Today I thought about checking it in P 9 since I'm getting close with my speaker project and sure enough, it works. Thank you P 9, er PCNetSpec! Re: Good News, bluetooth works! That's another thing that I want working on my M6. Could you maybe say more about it? Hi Brotherred, not much more I can say, I plugged in the dongle, fired up Bluetooth Manager and it all worked. 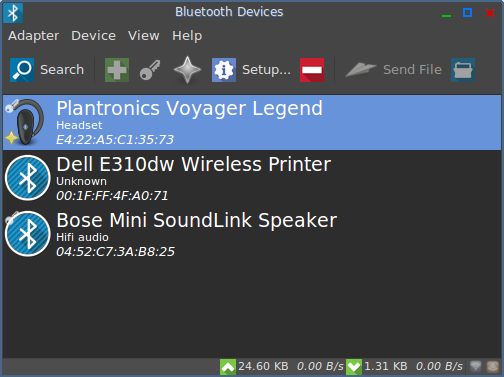 In P 8 Bluetooth Manager would recognize the bluetooth device I was trying to pair and would pair but would not output any sound to it. Got a few 'blue devices' on my Peppermint 7 'Road Warrior'. In my experience, BT is always a PITA to setup, regardless of the OS, but once you get them config'ed they seem to hang in there. You don't hear the words "Bluetooth works" too often haha. Cool stuff, Alynur.